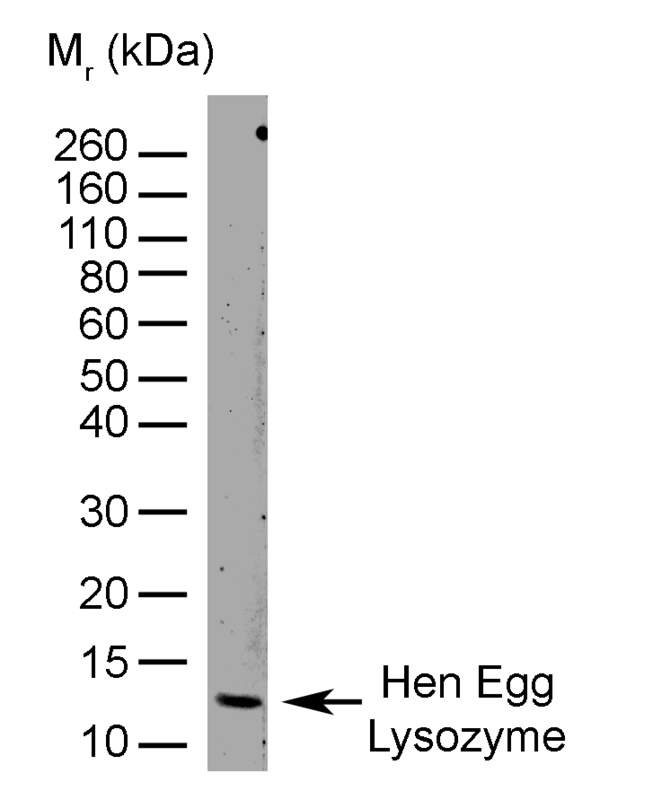 Human anti Chicken Hen Egg Lysozyme, clone AbD11397, specifically recognises Hen Egg Lysozyme (HEL), known also as muramidase or N-acetylmuramide glycanhydrolase, a 14kDa enzymic protein involved in the destruction of bacteria. Lysozyme damages bacterial cell walls by catalyzing hydrolysis of 1,4-beta-linkages between N-acetylmuramic acid and N-acetyl-D-glucosamine residues in a peptidoglycan and between N-acetyl-D-glucosamine residues in chitodextrins. Lysozyme is abundant in a number of secretions, such as tears, saliva, human milk and mucus. It is also present in cytoplasmic granules of PMN’s and high concentrations of lysozyme are present in egg white. C-type lysozymes are closely related to alpha-lactalbumin in sequence and structure making them part of the same family. A monovalent human recombinant Fab (lambda light chain) selected from the HuCAL® phage display library, expressed in E. coli. The antibody is tagged with a V5-tag (GSGGAPGKPIPNPLLGLDSTDAP) and a his-tag (HHHHHH) at the C-terminus of the antibody heavy chain. This antibody is supplied lyophilised. Lysozyme from chicken egg white.